The Festival has a history of presenting Australian premieres and many of Australia's most memorable productions such asCloud streetandSmoke & Mirror shave resulted from Sydney Festival's commitment to nurture local artists. It has brought many of the world's great artists to Sydney including: Ariane Mnouchkine and Thèâtre du Soleil (Flood Drummers), Robert Wilson (The Black Rider), Robert Lepage (Far Side of the Moon, The Andersen Project, Lipsynch), Schaubuhne Berlin (Hamlet), Netherlands Dance Theatre, James Thiérrée, Philip Glass, Ian McKellen (Dance of Death), Peter Sellars, Batsheva Dance Company, National Theatre of Scotland (Beautiful Burnout,Black Watch,Aalst), Al Green, AR Rahman, Kneehigh Theatre (Tristan & Yseult,The Red Shoes), Wayne McGregor's Random Dance (Entity), Ludger Engels and Vivienne Westwood(Semele Walk)and Fabulous Beast (Rian). Reconciliation Action Plan: Sydney Festival’s vision for reconciliation is to formally and informally engage with Aboriginal and Torres Strait Islander artists and communities and to positively contribute to improving outcomes for Aboriginal and Torres Strait Islander peoples. 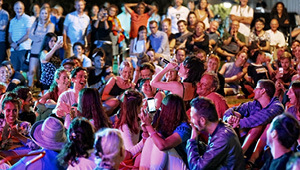 Disability Inclusion Action Plan: The Sydney Festival Disability Inclusion Action Plan supports our commitment to being for everyone in Sydney, regardless of accessibility needs, and provides our organisation with strategic direction in addressing accessibility issues. Sustainability Plan: Sydney Festival has a vision is to be the most sustainable major performing arts festival in Australia. David is the Co-Founder and Managing Partner of Bailador Investment Management and Chairman of listed companies, Bailador Technology Investments, Trade Me and Kathmandu. Prior to this, he was Chief Executive Officer of Fairfax Media. His previous experience also includes a period as an advisor to the Prime Minister of New Zealand. He is currently the Chairman of Trustees of Sydney Grammar School and sits on a number of other Boards and charitable organisations. Prof. Larissa Behrendt is the Professor of Law and Director of Research at the Jumbunna Indigenous House of Learning at the University of Technology, Sydney. Larissa won the 2002 David Uniapon Award and a 2005 Commonwealth Writer’s Prize for her novel Home. Her second novel, Legacy, won a Victorian Premiers Literary Award. She is the former Chair of the Bangarra Dance Theatre and a board member of NSW Museums and Galleries. Paddy is a registered company auditor, a partner at PwC and is also Deputy Chair of its Board of Partners in Australia. She has over 25 years' financial experience with PwC in the UK and Australia across a broad range of clients with a focus on the retail, consumer and agribusiness sectors. She is also a Trustee of the Historic Houses Trust of NSW (Sydney Living Museums) and a governor of the Sir David Martin Foundation. Angela Clark was formerly Director, Digital Network at the Australian Broadcasting Corporation, after joining the ABC Executive as Director of the Innovation division in March 2012. Angela started her career as an investment analyst before joining JCDecaux Australia at 26 years old, becoming its first Managing Director and launching the company's operations across four states. Seven years later Angela joined Macquarie Radio Network as CEO, leading the company for five years before leaving radio to pursue her passion for digital media, founding a number of start-ups in citizen powered and local news. Angela has previously held Directorships across arts, media and sporting organisations including; South Sydney Football Club, Biennale of Sydney, Bundanon Trust, Performing Lines and Commercial Radio Australia. Angela holds a BA in Politics, Philosophy and Economics from Oxford University. Since joining Blackfella Films in 2000, Darren has produced many award winning productions including the landmark multi-platform history series First Australians, feature documentary The Tall Man, factual series First Contact, and the tele-movie Mabo commissioned to commemorate the 20th anniversary of the landmark High Court decision. In collaboration with acclaimed UK writer Jimmy McGovern, Darren has also produced two series of the Logie Award-winning Redfern Now for ABC1, with a final tele-movie to screen in 2015. He is currently Executive Producer on the factual series DNA Nation for SBS and the ABC3 teen drama series Ready for This. Darren currently serves on the board of Screen NSW and is the Deputy Chair of the Council of the Australian Film, Television and Radio School (AFTRS), and in 2012 was the recipient of the prestigious AFTRS Honorary Degree. Diana Eilert is a professional non-executive director. She is currently a director of ASX listed companies Veda and Navitas as well AMP Life, Networks NSW (the “poles and wires”) and Queensland Urban Utilites (water). Diana also has extensive executive experience running large businesses - such as Suncorp’s entire insurance business - as well as recent digital experience gained in her 3 years with Newscorp where she was also a director of real-estate.com.au. Diana has a long held enthusiasm for the Sydney Festival and in her executive career was one of the major sponsors under the GIO brand. Matthew has over 30 years' experience in the advertising and marketing industry across a range of roles in Australia and the UK. Prior to Enero, Matthew was a founding partner of BMF and was CEO for 15 years from its inception through to BMF being named as ‘Agency of the Decade'. Matthew was Chairman of the EFFIE Advertising Effectiveness Awards for 10 years and spent 15 years as a National Board member of the peak industry body, The Communications Council and the Advertising Federation of Australia (AFA). He also served as National Chairman of the AFA. Matthew was a Board member of the international aid organisation Médecins San Frontiérs/Doctors without Borders (MSF) for 10 years.